Looking for information about a specific country? It’s reasonably easy to assemble statistics about almost any country in the world. Do a Google search and you’ll find pages and pages of links. In 0.24 seconds a search for statistics for Ghana yielded 113,000,000 results. Overwhelming. You may already have your favorite sources for basic information and statistics. Wikipedia or the World Bank? (Worldbank.com), CIA’s World Factbook or EconStats (econstats.com) from the International Monetary Fund. The list is long. But when you want to know more about a country than it’s GDP, physical size, or literacy level where do you go? 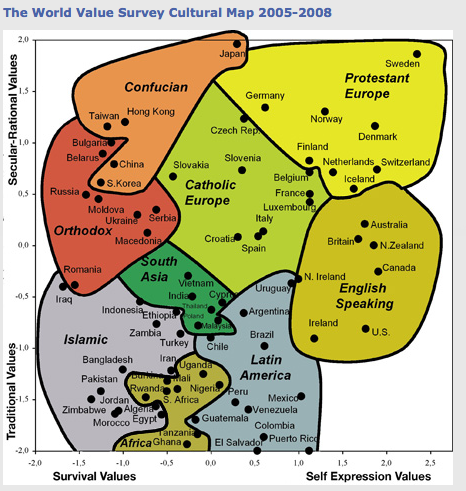 One lesser known but fascinating source the World Values Survey. (worldvaluessurvey .org) Creators of the unusual world map shown above. For me one particularly fascinating result of the surveys is the Cultural Map shown here. 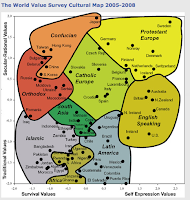 Countries are located on this map based on the similarities of their values, culture, using cultural dimensions as defined by the WVS researchers.These social scientist assert that there are two major dimensions of cross-cultural variation 1) Traditional values versus Secular-rational values and 2) Survival values versus Self-expression values. Traditional values emphasize the importance of religion, parent-child ties, deference to authority and traditional family values. These societies have high levels of national pride and a nationalistic outlook. Secular-rational values have the opposite preferences to the traditional values. These societies place less emphasis on religion, traditional family values and authority. Survival values relate to economic and physical security while Self-expression emphasizes well-being and quality of life. The global cultural map illustrates where countries fall today in relation to these dimensions through 2009. If drawn today, you might see some change. Societies evolve. Some become more industrialized. Other move from an industrial base to becoming a knowledge society. How will the next version of the map look? The WVS will answer that question after they complete the survey now underway that will be completed in 2014. Where is your country on the current map and where will it be? Will its neighbors, sharing similar values the same as they are on the current map? It isn’t their first adventure outside the US. 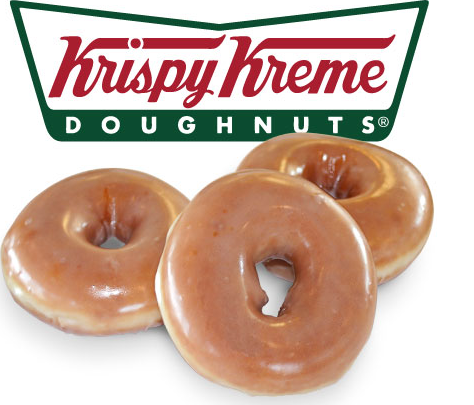 Krispy Kreme is in 17 countries including Thailand, India, Kuwiat and Japan. In Moscow they join other familiar names: Starbucks with 57 units, McDonald's with 378 outlets throughout Russia and KFC that is planning to expand to 450 units by 2015. But will this food from home seem like food from home? How much will the menus change and adapt to local tastes? In the Washington Post article above they mention that special flavors appealing to local tastes are now being served. 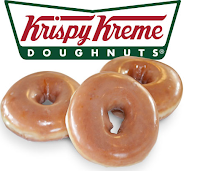 Even this tasty American treat, like many that have been there longer, is now both global and local. In our family a highlight of Rosh Hashanah, the Jewish New Year, celebration is sharing a dinner that includes the holiday Challah. The one pictured here was handcrafted by my daughter. Its traditional round shape symbolizes the on going cycles of each year. 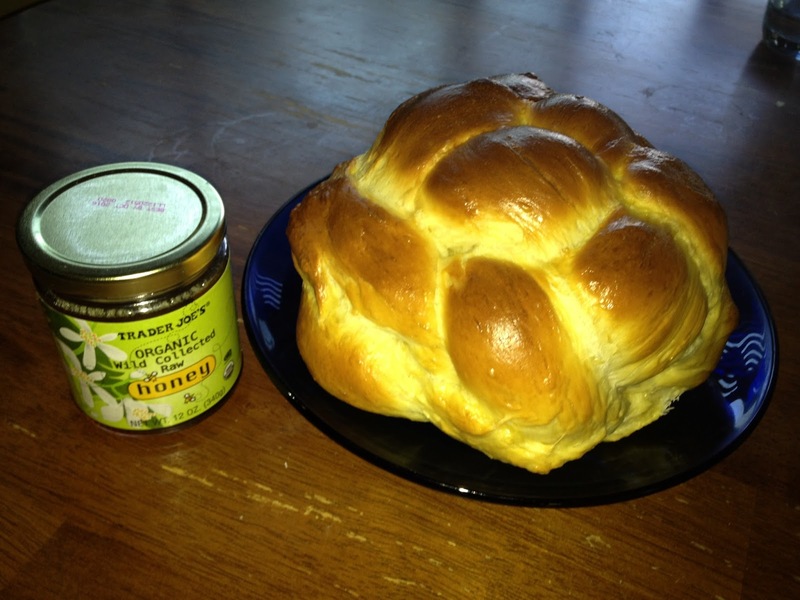 Thinking about the Challah reminded me of the importance of bread not just for holidays but also throughout the year. Historians remind us that throughout the centuries, in many countries, the price of bread has been carefully regulated to insure its availability. In medieval times bakers who didn’t follow the government guidelines, who charged too much, could be punished, even executed. Providing bread for the general population was serious business then and it remains so today. Handshakes, bows, kisses. These are the physical elements of greeting rituals, how we first engage with people we meet – wherever we are. And greetings can be tricky. For most of us our greetings will never be picked up by the international press. 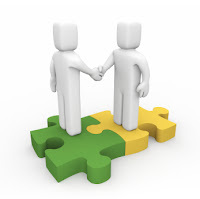 But getting it right or wrong can make a difference in our connections with the people we meet, the deals we do, the partnerships or teams we hope to build. It’s easy to assume that the form of greeting we use at home will be considered polite and appropriate everywhere. But it’s not true. What’s polite varies around the world. A reminder of that reality is included in an article in the current issue of Monocle (monocle.com). in a piece titled “Inside Track: Business Etiquette some key points to consider if you’re doing business in Burma, China, Mexico or Ghana are discussed. One of the topics: Greetings. According to the article, in Burma business cards are more important than other formalities. In Ghana, remember to use academic or professional titles along with a handshake. But not all handshakes are alike. In Mexico its firm, in the Middle East a firm handshake can be considered rude. In Thailand and China handshakes are not part of the traditional greeting ritual. Before you engage with people from other places, other countries, other traditions it’s good to do some research so the greeting you extend carries the message you intend: I’m pleased to meet you, to get to know you, to do business with you.